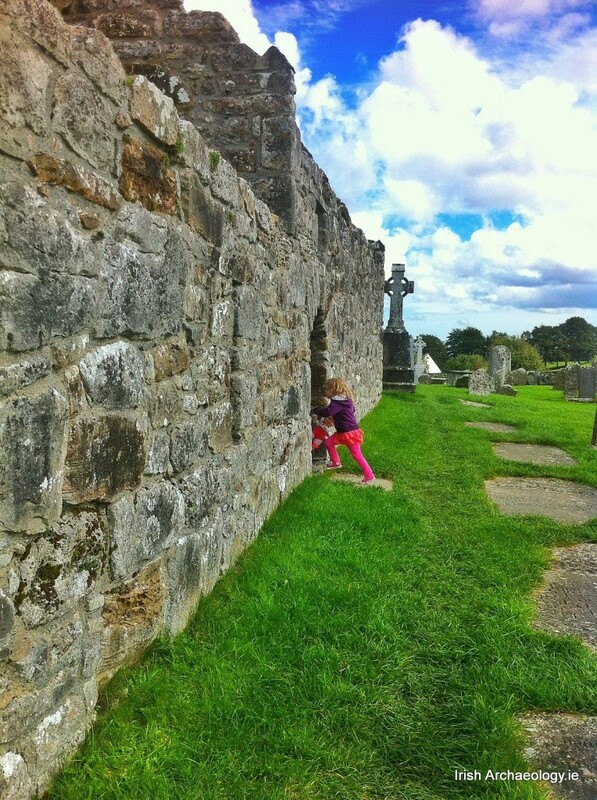 Stopping off with my family on the car-journey between Dublin and Galway recently, I had an opportunity to visit the famous archaeological site of Clonmacnoise. Located right in the centre of the country, where a major east-west route-way met Ireland’s longest river, the north-south running River Shannon, the famous early medieval monastic settlement site was a once-important town. The first church there was founded by St Ciarán in the 6th century AD and by the 7th century had become an important ecclesiastic centre with a large lay population, where worship, learning, trade and craftwork took place. 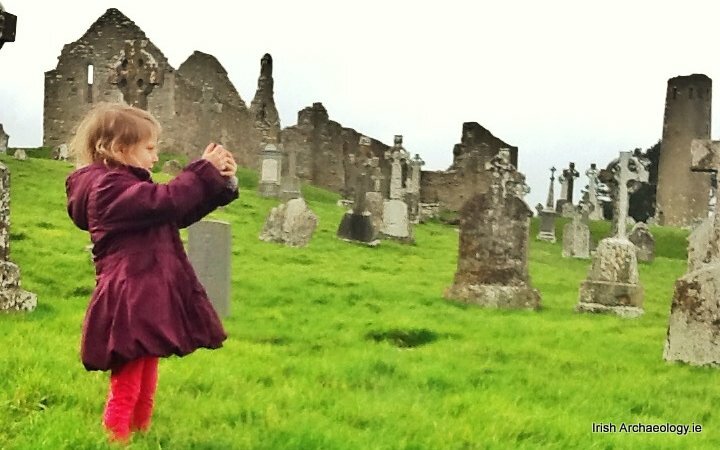 With excellent surviving remains of stone churches, high crosses, grave slabs, a medieval residence and a round tower, the site is one of Ireland’s major tourist attractions. We got to watch some of the informative interpretative video at the visitor centre, until my two-year-old son began to interrupt the viewing experience for the other visitors and we had to leave. Before going outside, we visited the original high crosses, which are now stored inside the visitor centre (there are replicas in their former positions outside), but my two-year-old began to interfere with the underfoot spotlight fittings, so we had to leave. 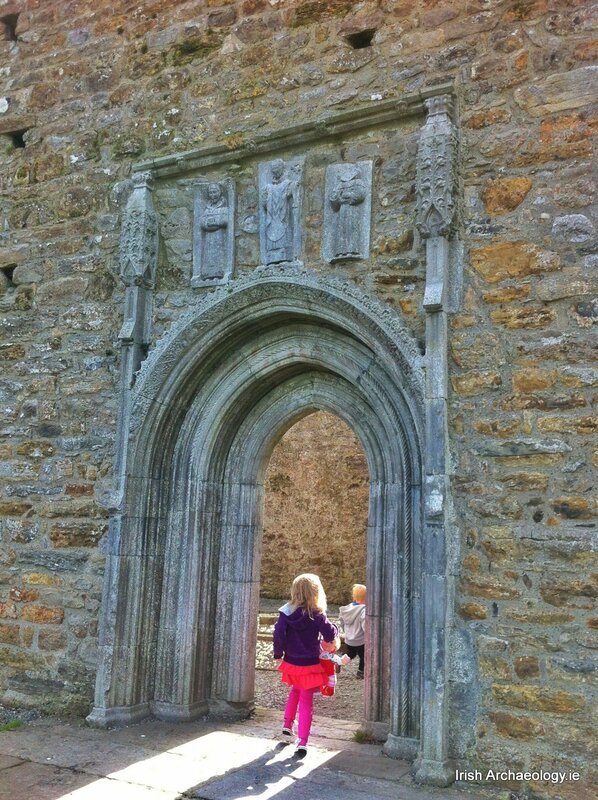 Outside, we had an enormously pleasant time exploring the ruins. And then I took out my technology. I had arrived with both iPhone and iPad in hand, both already loaded with the Lost City of Clonmacnoise app from the iTunes App Store. 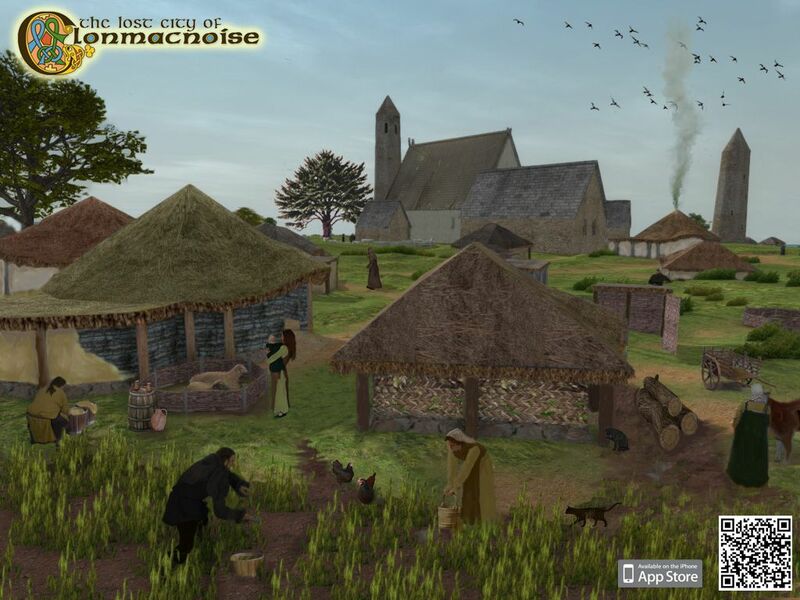 Created by RealSim Games, the app combines 3D reconstruction with the GPS, compass and touch screen functionality of the iPhone and iPad, allowing users to navigate their way around the site through the sights and sounds of the distant past, all recreated digitally and in 3D on the app. My 5-year-old, already well-acquainted with the app from using it at home, took the iPad to find her bearings, while my sister wandered on ahead in pursuit of my 2-year-old. 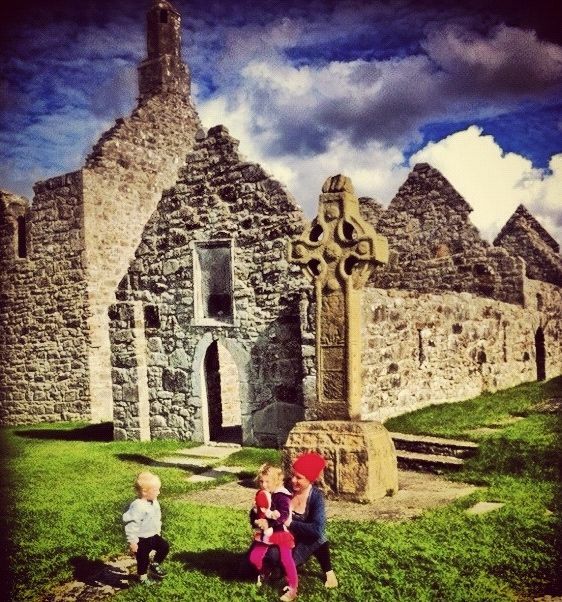 I made sure the location settings on my iPhone were switched on and quickly figured out how to use the GPS feature – whilst on location at Clonmacnoise, the device’s GPS and compass follow the user to reconstruct the site as it would have been about one thousand years ago. I began to make my way around the site, phone held aloft. 3D reconstructed versions of the ruins began to appear on the screen. As an iPhone and Instagram addict, I am already well-accustomed to viewing the world through the lens of a smartphone screen. This time, however, it wasn’t my phone’s camera feature I was using to observe, it was the realistic graphics of the app that were recreating the scene before me, in real space, in the infrastructure of real physical landmarks. It didn’t even matter that the skies before me in real life were slightly greyer than the blue skies in the app. I began to feel that the world represented on my iPhone screen and the one I was walking in were one and the same. I looked towards the round tower. Through my phone, it rose majestically to its full height, roof intact. I lowered my phone, and looked again towards the tower. Shorter in stature; roofless; a ruin. My mind took a wobble. I jumped out of the way of a tree, only to realise it wasn’t physically there. I walked to the cathedral. On my phone screen, it loomed to its full gable height. I entered the ruin, still watching through my phone, which showed me rows of virtual benches seating prayerful monks. I found myself physically stepping around them. Outside the cathedral, I walked amongst graves. Here a quirky feature of the App gave me a start: a ghost floated before me! Suddenly I felt them all around. My two-year-old appeared nearby, noisily interrupting a tour group. I intervened to re-orientate him along the path in front of me, before looking back to my phone screen view. Again I was alarmed. There was no sign of my toddler – had he bolted already? I lowered the phone, and there he was, strutting in front of me along the physical path. I began to fully appreciate the impact of using this app, as the distinction of what was “real” and what was augmented began to blur in my very mind. By tapping on structures on the screen of my device, I could choose to read more about that structure. In such a deeply immersive archaeological space, where the physical world crosses over with the digital, I found myself learning, and questioning, more about an archaeological site than ever I had visited or had read about before, and far more quickly too! I decided that this is what learning archaeology should be all about. 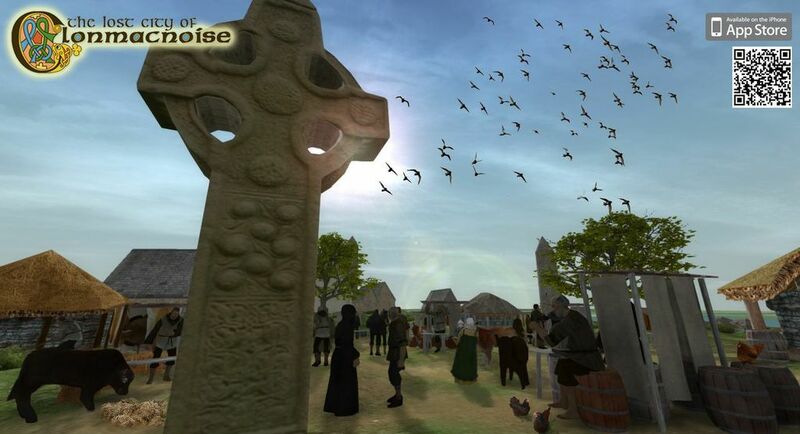 The Clonmacnoise app is an excellent demonstration of how archaeologists can use digital technology and the still-emerging phenomenon of ‘augmented reality’ to interpret and share knowledge: by mashing up the evidence of what was lost, onsite, with the tangible remains of what still stands, an acutely experiential, and utterly enjoyable, lesson is made possible for the archaeology-interested user, regardless of age or expertise. The game originated as the brainchild of Gavin Duffy, RealSim’s Managing Director; I didn’t get to meet him when I visited, but he can be seen using the app on the YouTube video below, which gives a good sense of how the app is used onsite. Using aerial survey, mapping, photographic references and GPS (Global Positioning Systems) technology, the developers created the app using gaming software. They worked with archaeologists Heather King, and Robyn, to ensure archaeological accuracy and authenticity and to piece together gaps where evidence has not survived so well. The human figures in the game are real life re-enactors from Fingal Living History, dressed in full authentic costume. There is a clear sense of passion amongst the team for the app, which is the world’s first full 3D GPS guided ancient environment app for a mobile device. 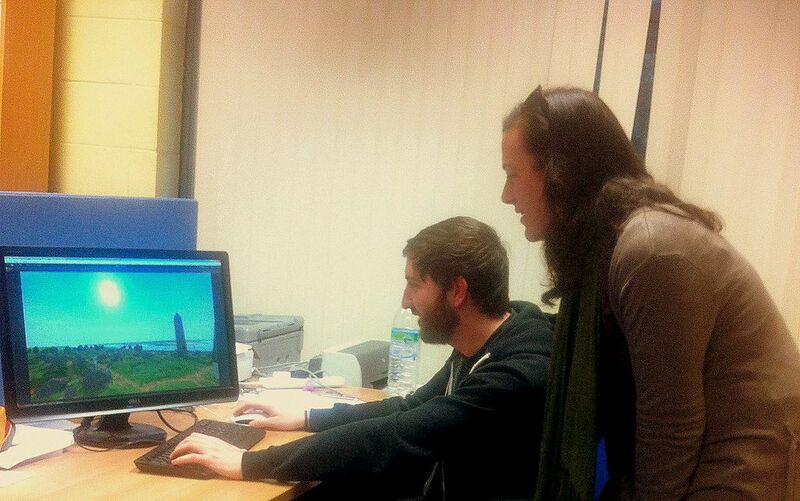 The team are currently working on the Clonmacnoise app’s latest upgrade, which will feature even more detail, even higher resolution and will be even more animated. In more good news, another exciting project focusses on the heritage of Galway city. Using the beautiful pictorial map of the city as it was in 1651, another 3D digital immersive environment will bring back to life the sights and sounds of the 17th century city. November – Mid March: Daily 10:00 – 17:30. Mid March – May: Daily 10:00 – 18:00. June – August: Daily 09:00 – 18.30. September – October: Daily 10:00 – 18:00. Fascinating! Thank you so much for writing about this app, your experience with it, and the team who produced it. I absolutely LOVE it when technology helps me learn about ancient places and people, especially in such an immersive, fun way! Next time I am in Ireland, I definitely will have this and some of RealSim’s other apps loaded and ready.